A company decides that they want to launch a community. They imagine how people will actively participate and grow to love their brand. They do some research around what platform to use for the community, send an email to their audience and boom, they launch it. Quickly, they find that the results look starkly different from how they imagined. Members aren’t participating as much as they thought they would. The company is unsure of the goals of their community. They don’t know how to grow it, and forget why they started it in the first place. After lots of internal discussions and a mediocre attempt at energizing the community, they start to get skeptical of the value of community. Before you know it, they shut it down and never look back. I’ve seen it happen time and time again. And it’s a shame, because if these companies took just a short amount of time to think through some important questions before launching their community, they could have saved a lot of time and money. They get stuck in the strategy and logistics of building their online community. And as a result they’re left with discarded ideas, failed community plans and communities that have turned into wasted ghost towns. In reality, many of these challenges – that have doomed many communities into virtual wastelands- can be overcome when you have the right strategy and plan in place. 1. What core business goal(s) will the community help solve? Building a community should be treated like any other core, strategic business objective. It should tie back to a specific business KPI- ideally revenue based. For example, a company might ask want their community strategy to increase revenue or decrease support costs. This is easier said than done. However, if you can answer this question early on in your community, you are in much better shape for success than many. It will align your community work with the goals of the business. As an example, one of the more common business goals for launching an online community is to scale customer support. One company that does a particularly great job with this is Skype. 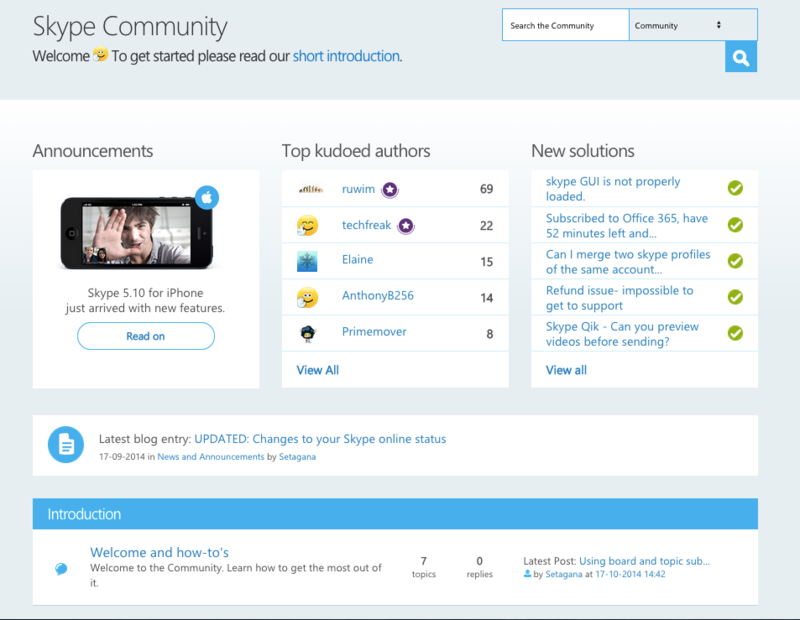 Their large community is a great place for Skype users to go to ask questions and get help. 2. What dedicated resources will you allocate to grow the community? Building a community from scratch takes time. A lot of time. It’s not a case of build it and they will come. It’s build the community, cultivate a ton of relationships and promote it heavily, then they might come. This takes a lot of hard work and time to get the community up and running. That’s in the early community days. If your community takes off, you then need to consider scaling and moderation concerns. At the very minimum, you should have 1.5 people working on your community from the get-go. Ideally, you should have a small team in place. One community pro, who has done a fantastic job of building and scaling an awesome team is what Jennifer Lopez has built as the Director of Community over at Moz. You can read more about how they grew their community team here. 3. What is your strategy or roadmap for achieving your core business goals? This ties in nicely with the first point. Once you have the core business goal the community should solve for, you need to spend time fleshing out your strategy. The value that community can bring your company in the first month looks very different from the value it brings in 12 months. Often, community create a lot of value in the long run but may not have a huge impact right away. The tactics you need to use to keep members engaged at different stages of your community’s growth will change too. For many, this includes creating a community roadmap. Here’s a great resource from the Community Roundtable to help with this. While your roadmap will certainly evolve over time, this will provide you with the big picture framework and keep you from getting too buried in the tactical weeds of growing your community. 4. Do you have an editorial calendar with seeded content to start conversations? The only things that will draw people into your community is awesome content and conversations. At the early stages, you will be seeding most of the content in the community. You should have a sizable list of evergreen content to seed in the community – along with real-time topics and news as you see fit. The key is to make the content enticing, fun and/or informative. You want community members to take some sort of action on the content they read. You want them to like, comment or share it with others. The quickest way to stop that from happening is to create dry, boring content filled with corporate buzzwords and jargon. There’s a ton of tools and resources out there to help community managers plan, organize and publish great content. These range from full-on content calendar apps, like Kapost, to Google Spreadsheet templates, Evernote shared notebooks and even shared Google calendars, as in this awesome example from the folks at Hubspot. 5. Where will you talk to your customers and where will they give you feedback? This is a bit more relevant to customer support communities. As you get more people participating in your community, it’s natural for them to want to provide feedback This is good because it provides community members with a sense of ownership in the community. They want to find ways to make the community even better. To continue to grow the community, you need to acknowledge community members’ feedback. This doesn’t mean that you need to say, “yes” to every suggestion the community makes (Please don’t do that, as you will wind up with a bloated, terrible experience). It does mean however that you should respond back to requests saying why or why not you will consider it. 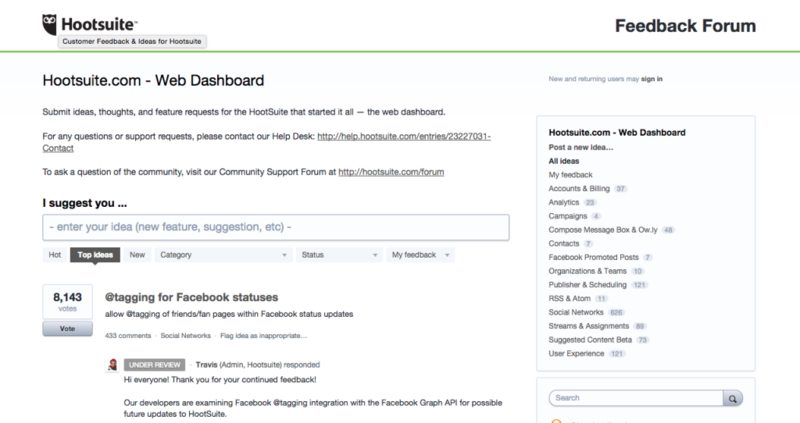 Hootsuite does a particularly good job with this via their customer feedback channel. 6. Who will have access to your community and who won’t? Every community has people who belong and people who don’t. Sometimes it’s deliberate, like adding a paywall to join, or making people apply for membership. Other times the boundary is more cultural. Making your community accessible and open to everyone isn’t always the best approach. Instead, you may want to build in exclusivity in order to make people feel like they really belong. This helps foster a shared group identity and value. Once you know what your value-add is, you can recruit only the people who are the most likely to want to join and participate in the community. 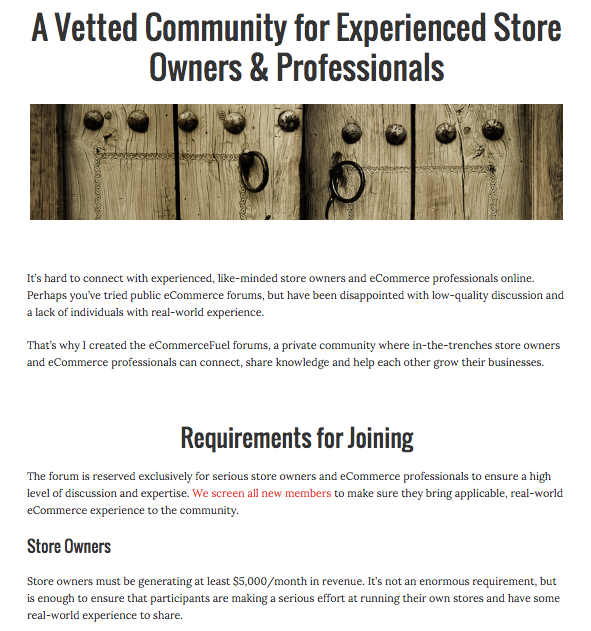 For example, Andrew Youderian does a great job with this with the EcommerceFuel community. In order to join the community, you have to apply and meet some requirements. In turn, it’s easily one of the most tight-knit, highly engaged, high-quality online communities out. You need to have actionable tactics for growing your community. Where will your members come from? Will you send email invites? Do you expect your members to refer new members? 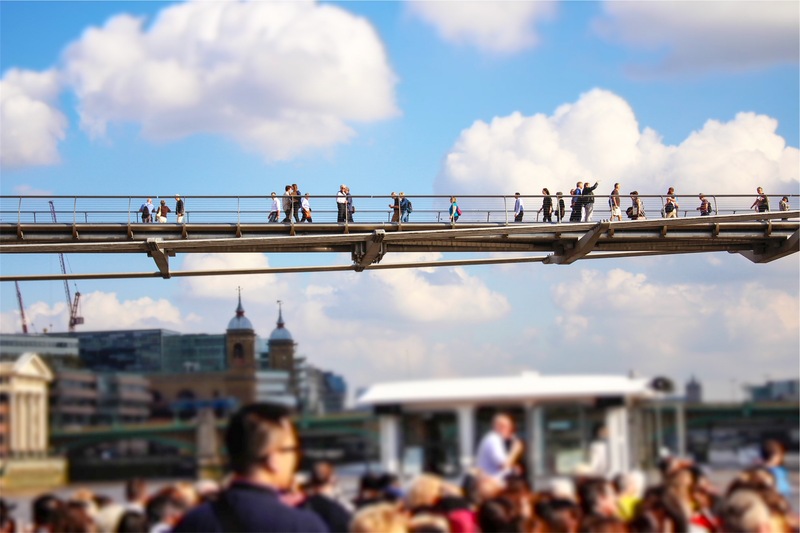 Do you already have an audience that you’ll convert into the community or are you going to be reaching out to people who have never heard of you? For most new community professionals, this tends to be a bit of an afterthought. This is how you can fall into the dangerous wormhole of “get members quick” tactics, like “giveaways,” “PR stunts” and “viral videos.” While all three of these are great PR tactics, they are terrible for building communities. That’s because it incites one and done interactions, and then they never come back leaving your community to a branded ghost town. Instead of relying on these tactics, you need to spend time seeding content that builds stickiness and relationships between the early adopters in your communities. These relationships are the glue that will keep members coming back and contributing again and again. One branded community that does a great job with this is Wistia. They have used live video and chat AMAs to generate buzz and really solid commentary. One of their most popular AMAs was the one they did with Moz’s Rand Fishkin. Most great communities were seeded by an existing audience. For example Reddit’s initial audience largely came from Paul Graham’s blog. Airbnb brought a lot of their members in from Craigslist. Where will your members come from? With these seven questions, you should be well prepared to launch your community without missing too many red flags. Take the time up front to think through them, and you’ll save a ton of time and money down the line.